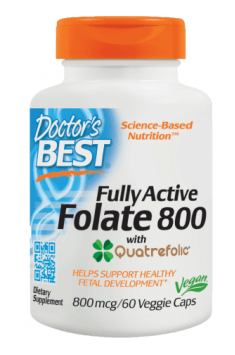 Doctor's Best Fully Active Folate is a dietary supplement in capsules with the most bioactive, stable form of folate as the glucosamine salt of (6S)-5-methyltetrahydrofolic acid (5-MTHF). Folates are involved in the regulation of growth and cell function and division, influence beneficially the nervous system and the brain, prevent neural tube defecits in the foetus, have a positive impact on the development of newborns and contribute to normal blood production. Folic acid (vitamin B9), contrary to the common view, is not the same as folate. Folates are the general name for its natural derivatives with similar properties whereas folic acid is a synthetic form of vitamin B9. Unlike folates, folic acid is not converted into the bioactive vitamin B9 in the digestive system but mainly in the liver, which is less efficient and much slower. The body needs more time to produce an active form of vitamin B9. In some cases, it may have a problem with metabolising fully even small doses of the compound. The formulation contains the most bioactive form of folate as the glucosamine salt of (6S)-5-methyltetrahydrofolic acid (5-MTHF). Natural and the most richest dietary sources of folates are: green vegetables, legumes, yeast, yolks, liver and citruses. It is worth noting that natural folates are not stable because they are sensitive to among others, light, temperature, oxygen and thermal processing. Maintaining normal and stable folate levels prevents impaired DNA methylation, abnormalities in the synthesis of purines and pyrimidines and hyperhomocysteinemia. Folate metabolism is also associated with the methylation of neurotransmitters and phospholipids which are a major constituent of cell membranes, histones, myelin and hormones. Adequate folate intake is critical to normal metabolism of amino acids, including cysteine, glycine, serine and methionine. Folates are involves in many biological processes inside a cell and their normal levels reduce the risk of cardiovascular diseases and neurological and haematopoietic disorders. L-5-methyltetrahydrofolate (5-MTHF) is an important element in the production of methionine from homocysteine. Impaired homocysteine metabolism results in its accumulation in a cell and consequently its transfer to the blood. Depending on the severity of disorders, serum homocysteine levels may increase differently.Its overaccumulation is called hyperhomocysteinaemia, which is believed to be one of the high-risk factors for cardiovascular and neurodegenerative diseases, birth defects and cancer. A particularly important group in terms of folate supplementation are women who are planning to have a baby and pregnant and breastfeeding women. Proper folate intake by pregnant women may reduce the risk of numerous complications, including: miscarriage, stillbirth, foetal growth restriction and birth defects. The next interesting aspect of adequate folate supply by mothers during the prenatal period is a reduction in the risk of impaired mental development in children. Folates affect the growth and division of glial cells, neurons and are also involved in the production of neurotransmitters, i.e. serotonin, noradrenaline, adrenaline and dopamine, which promote the development of their nervous system even after the closure of the neural tube. Inadequate folate intake is not the only reason why their supplementation is recommended. Many modern scientific studies provide evidence that a large part of the population suffers from genetic deficiencies of enzymes which enable the body to metabolise the frequently supplemented folic acid into active coenzymes. These deficiencies are mainly associated with a mutation of the MTHFR gene. To sum up, Doctor's Best Fully Active Folate is a dietary supplement which enriches your diet with folates that are extremly vital to normal functioning of the body. Folate supplementation is recommended especially to all individuals who are at risk of deficiency, in particular: pregnant women, newborns and the elderly. Adequate folate intake may promote healthy brain development of the foetus and its function in adults. It has also a major role in maintaining mental and emotional health. Fully Active Folate 800mcg 60 caps. The supplement may contribute significantly to reducing the risk of having a child with a brain or spinal cord defect, promotes normal blood production, supports a healthy immune system and helps reduce fatigue. It is recommended especially to women planning pregnancy or who are pregnant or breast-feeding and individuals with a mutation of the MTHFR gene. It is said that even one in two individuals may have a deficiency of the enzyme responsible for converting folic acid into an active form. Sarsaparilla root. Promotes the growth of muscle mass, facilitates regeneration, alleviates inflammations.